We’ve been celebrating #RememberMeThursday and have been quite busy spreading the world about adoption. Many of our online friends joined with us and it made me proud to see all their hard work. If it’s Friday, you know it’s Friendly Fill In blog hop time #124 hosted by our furiends 15andMeowing and Four-Legged Furballs. We invite you to join the blog hop or, if you prefer, you can opine about your fill ins in our comment section. 1. A ________________ will ___________________. 2. The best time of the day is __________________. 3. _________ is not my strong suit. 4. It’s all fun and games until _________. 1. A good day will always be made better when you find your purrfect sun spot! 3. Patience is not my strong suit. Hello! The water bowl is getting low! 4. It’s all fun and games until someone sits in the rocking chair. Whoa Human, don’t sit there! As you may know, all of the Tribe of Five are adopted kitties and we purrticipate in #RememberMeThursday every year to bring awareness about cat adoption. 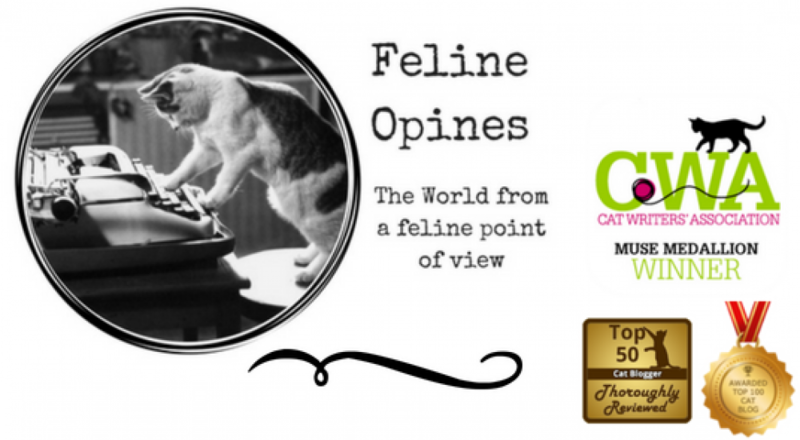 Because we are feline bloggers whose meows are heard around the world we belong to a number of international cat groups. We get to “meet” some pretty amazing folks on the web who take cat adoption seriously. One of our favorite internet humans is a man named László who lives in Eastern Europe. We met him and his clowder through a Facebook group called Our Cats <3. Our female human says that the internet can be an unfriendly place. Even the safe haven of cat groups can be a dangerous place as she’s seen a post from someone asking for advice receive judgmental and divisive responses. I would think that a mutual love of cats would bring you humans together but sadly, that is not always the case. Happily the Our Cats group is not like this. As soon as we joined the Our Cats group we became furiends of László’s tribe of adopted felines. The diamond in his crown of cats is Apollo, who he calls Apollo Bug. This sweet one-eyed tabby is beautiful and delightful and every photo László shares shows how much Apollo Bug is loved, as well as all the other rescue felines in the household. László and his family are wonderful humans who never turn their backs on a rescue cat in need. About a year ago, they rescued a little black female cat and soon found out she was pregnant. There was no question that those kittens would become a part of the family and the group members have enjoyed watching them grow up loved, protected and happy. The Female Human says that over 168,000 members of this group are connected to this clowder of cats. In August the group received disturbing news and our Female Human had leaky eyes after she read a post about Apollo Bug. He was taken to the vet for an emergency visit and was diagnosed with dangerous urinary issues. The vet put a cone on him and gave him a catheter. The photos of poor Apollo Bug were heart rendering. That’s when the humans in the group sprang into action. Posts of encouragement, love and prayers flooded the internet and an international fund-raising effort was created. The multiple vet visits, special food and other costs were overwhelming for László and his family and although they never asked for help, the humans in the group wanted to help this sweet little rescue kitty and the humans who cared for him and the rest of their felines. We followed Apollo’s recuperation and recovery with our hearts in our throats and when the post appeared that the catheter had been removed and Apollo had peed on his own, there was a collective sigh of relief and the sound of rejoicing (and lots of happy meows from The Tribe of Five). And after celebrating Apollo Bug’s return to health, we had another celebration when László announced the addition of the newest rescue to his family. Meet little Raisin, shown here with his big brother Apollo. Humans opine on and on about their view of the world and think their meowing will bring people together but they rarely are successful. They could learn from the story of this rescue cat and his humans who brought 168,000 people around the world together with love, prayers and help. Never underestimate the power of even one little rescue cat!